Pikamin88 : Foods & drinks | IBE TECHNO CO.,LTD. Nutritional ingredient (Folic acid) is newly added! "Multi nutritious enzyme liquid" made of 88 kinds of materials is contained. 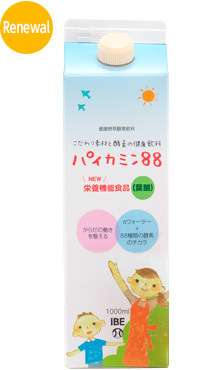 Pikamin88 is a health drink applying π-water system. Newly folic acid, lactobacilli, and isomaltooligosaccharaide are added. It contains enzyme liquid of 88 kinds of fruits, vegetables, herbs and beans. It takes 540 days to mature the fermented liquid. The base of its taste is apple vinegar, which is popular with all ages. 88 kinds of fruits, vegetables, wild herbs and beans are fermented, matured and extracted to prepare "multi nutritious enzyme liquid". It is a condensed plants' nutrition. Essential part of π-Technology used for the drink is called π-Fe Mineral h. This helps all living functions by combination of iron ions and minerals. Folic acid is a water soluble vitamin B fond in leaves of spinach. It supports formation of red blood corpuscles and contributes to the normal growth of unborn babies. Collagen is one of proteins in all human's tissues and mainly functions to join the cells. It reduces with aging. Pikamin88 is low in calories (42 kcal per 150ml). Apple vinegar, apple juice and plum vinegar make refreshing good taste for all ages. Drink with 2-3 times dilution with water. Or drink as it is. * Natural ingredient may be separated and settled and the color of liquid may differ, which do not change the quality. * This product does not contain any preservatives. Keep in a refrigerator after opening and consume earlier. * As this product contains honey, please refrain from babies' (younger than 12 months old) drinking. Pikamin 88 contains collagen (pig origin), oranges, apples, soybeans, yams, peaches, kiwi fruits, bananas, cashew nuts, sesames. Refrain from drinking if you have allergies to the ingredients indicated above. In case of feeling sick and disagree with your physical condition, please refrain from drinking. If you take medicines, consult with your doctor before drinking this product. Due to honey ingredient, this product will not for babies under 12 months old. Folic acid is a nutrient that supports formation of read blood corpuscles and contributes to the normal growth of unborn babies. Drinking a great deal of this product will not promise to cure diseases and improve health. Please follow the daily standard intake amount. Folic acid helps normal development of fetuses but the great deal intake of it will not lead better growth of them. This product is not a food for specified health uses and not inspected by the authority.